It’s already near-impossible to find a new computer that doesn’t have Vista already installed on it. As I’ve noted here, hardware driver compatibility can be a bumpy road. That’s the bad news. The good news is, application compatibility for Windows Vista is often not as big an issue. 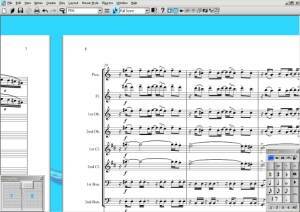 Music notation software, for instance, largely works, with a couple of additional notes regarding installation and registration. These links come via a promising new blog/podcast for music educators, Music Tech for Me. Both Finale and Sibelius (and various other tools from SmartMusic and Sibelius for education) are listed as “compatible” with Vista. There’s even a promised update specific to Vista from Finale for the summer. The only hitch is User Account Control (UAC) for software like Sibelius under Vista. Fortunately, disabling UAC isn’t so bad. As a quick recap, some applications may actually perform more smoothly under Vista. Cakewalk SONAR, for instance, has robust support for the new WaveRT audio system (if you have a PCI audio card that supports it) and MMCSS scheduling. Be aware, though, that those marginal improvements can be quickly erased by driver issues elsewhere in the system, which have a tendency to domino when it comes to both stability and performance. We could debate this all day, so I’ll just say this: there are still a number of cases where you would “downgrade” (upgrade?) a new Vista computer to XP, even if it means ponying up for a boxed copy of XP, and as with any major OS update on any platform, I wouldn’t even think of installing without a backup and rollback plan to the previous OS. If you can, test on a dual-boot system; it’ll make uninstalling easier.